The Greatest Used Book in History Continued: June 1988 | You Monsters Are People. This is the sixth installment of the fabled diary within a used book I procured from a clearance event for “junk books” in a rundown and partly abandoned library. 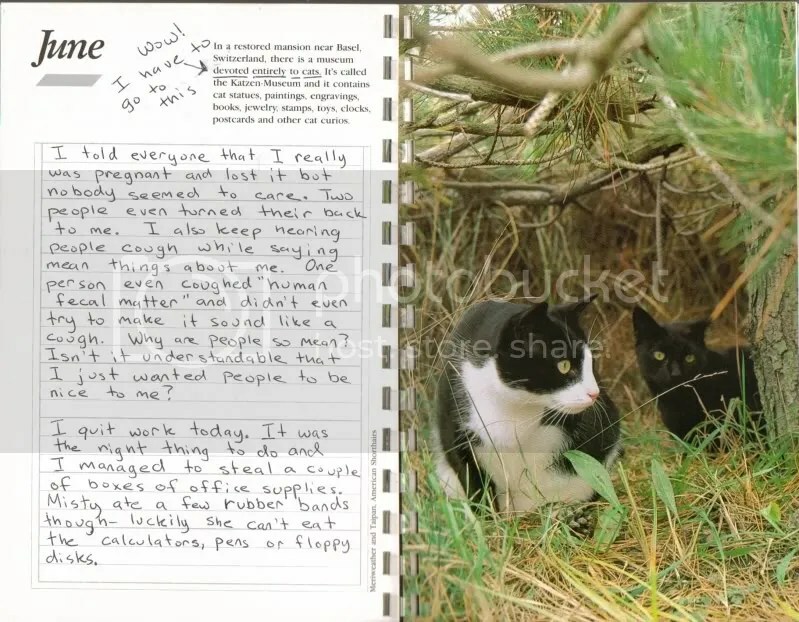 The journal is the story of an amazing woman living in 1988 who just happens to love her cats. 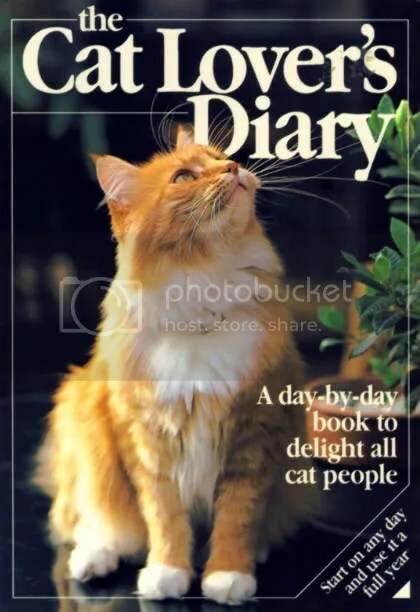 If you would like to enjoy her story from the beginning or catch up on some of her earlier entries, go to The Cat Lover’s Diary. This entry was posted in books, cats, Dark Humor, humor, Life, love, pets and tagged cat lady, cat lovers, cats, diary, fake pregnancy, greatest used book, mother daughter, office jobs, pile of socks, pregnancy. Bookmark the permalink. She shouldn’t have slapped her mother 7 times. Maybe if she kept it down to 3 or 4 the mom would have given her a loan? Isn’t seven supposed to be lucky? i hope you actually got every single diary this woman ever wrote in so this series can last FOREVER. Are you suggesting I tract down, stalk and then rob her? If littleelle doesn’t suggest it, then I do. This is the best thing of all time. The earlier months were funny in an I-can’t-believe-someone-is-really-like-this way, but I find June to just be too sad. Poor woman. I did get a good chuckle at her Oprah prediction, though. I assume that’s doubly true for a cat lady. Love this! I wonder why she slapped her mom 7 times and not 6 or 8. What’s the significance to 7? Analyze please. I’m not sure. Maybe she thought it was lucky. “the tale of one woman’s hell in 1988 continues” perfect. Hrm. I wonder if her lease says anything about the number of animals she’s permitted to have and if her landlord is aware of how many cats she’s now housing. Could get dicey. You’re going to love August then. “I gathered up my pile of socks, went home, and slapped my mom seven times”…I can’t even tell you how hard I laughed at that. Not that slapping her mom was funny, but just the image that came to my mind about this lady. Wow…I’m so glad you posted another installment of this Cat Lover. I was beginning to go through withdrawal. Please tell all of your friends about it. I’m hoping to get a gigantic following for this lady. 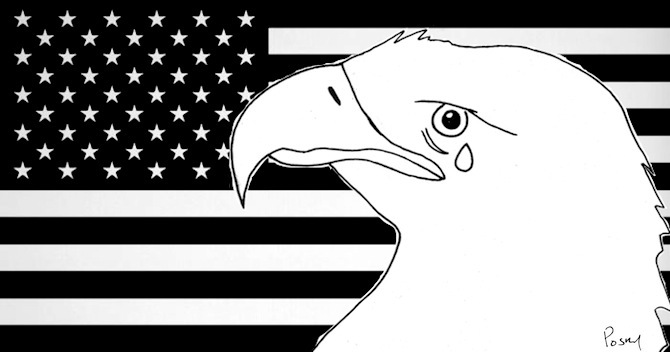 Also, I’m sorry you had to wait. Out of all my readers you are the last person I’d want to disappoint. Aww…that’s nice. :) But don’t worry…I certainly am not disappointed. This was so worth the wait. Her dislike for Oprah was more than enough to make my day. It’s so bizarre that I can’t imagine it being true, but who could make that stuff up? Okay, you could, Posky, but you wouldn’t be so mean. Would you? Was missing the wacko woman, so glad she’s back. Would it be mean? I don’t think so. It does seem too crazy to make up though. Are you kidding? This is a real diary?? I hate to say it, but this woman is giving cat lovers a bad name, and I’m not even a cat lover! So funny. Thanks for visiting The Domestic Fringe and leaving a comment. Hope you have a great weekend. I did have a good weekend. Is it real? I get this question a lot. I may have to pose with the book to prove that it’s not some photoshopped thing. As for the author, I made a promise not to share that. Maybe you should just believe whatever you think makes it the most entertaining. Well at least we now can shift some of the blameload onto the alcoholic mother. Where did you say you found this book again? It was in this old unused library that they send “junk books” to. Every couple of months, they sell everything they’ve accumulated before it’s destroyed. You can get a grocery bag full of books, records, old tapes, VHS and unpopular DVDs for five bucks a bag. I started going because I collect odd and antique books. I sense Mr. Greggo will be looming in a large way the the next installment. I love how she annotates the little drawings! Thank goodness…there is more! Mother Hen was beginning to think that she would never learn the fate of Jessica’s kittens, or what kind of place would hire this woman, or what the cats ate or peed on next!!! This diary is like one of those accidents that you can’t stop looking at even though you know you should do so as a civilized chick. This could only be more dismal if the author found out her personal…stuff was being published on the internet, but MH promises not to tell that it is Mrs. Farmer Brown’s cousin-once-removed. Mother Hen is in withdrawal! Where is the next installment? When is the next installment? Argh!!!!!! Where is the next installment? I must know!! And now going to see Big with Tom Hanks – what a heady social whirl! I am sure Tom had a ball!